I packed my teenage sons into our Jetta last spring and headed to Malheur Wildlife Refuge for a little bird watching. The tiny car gets good gas mileage for the 2 hour drive, but with 3 sons around 6 feet tall and a girlfriend, we were tightly crammed with bird books, binoculars, camera, jackets, gloves and a bunch of snacks (boys are never full). Driving east early in the morning, we spotted red-tailed hawks, pronghorns, ravens, magpies, and a golden eagle on the way. “Getting there” is a relative term. The hot bird area begins on a country road through farmlands rich with bird life, and ends at the southern tip of a marshy-edged dirt road(path). We passed Burns and drove through flooded farmlands. I’m sure farmers go nuts with crazy birdwatchers like us. “STOP, Mom!” someone would yell excitedly every few yards. I would pull over as we all reached for cameras, bird books, and binoculars to check out the feathery celebrity. Resident farmers passed widely by as we drunkenly swerved and stopped at random intervals along the country road. It was so much fun, though. So exciting to see a few birds we haven’t seen before, or have a mystery on hand to try to figure out exactly what one little flitter could be. Anyway, we headed out to a lake rumored to be famous for a gathering of Boneparte’s gulls. On the way, I spotted what I believe to be a Prairie Falcon (doubters let me know), high up on a dead snag branch, casting an intense view of his surroundings (i.e. yummy morsels of varmints or small birds). I managed to take a photo with my UltraZoom Canon camera. It’s a blurry little photo, probably due to someone wiggling around in the car for more snacks, but worked well for a painting. To begin, a vertical branch divides the canvas into thirds, while the lower horizontal branch divides the horizontal canvas into lower thirds. 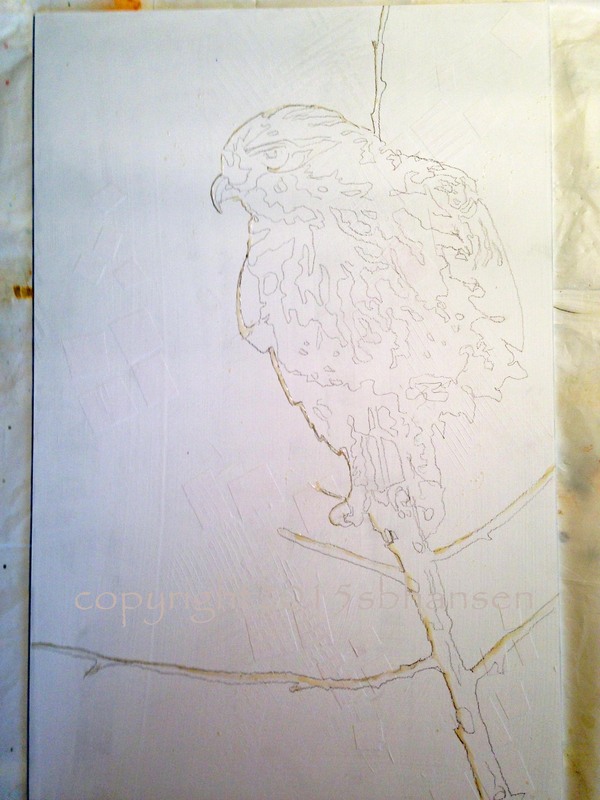 The falcon itself perches in the upper RH third quadrant of the canvas. 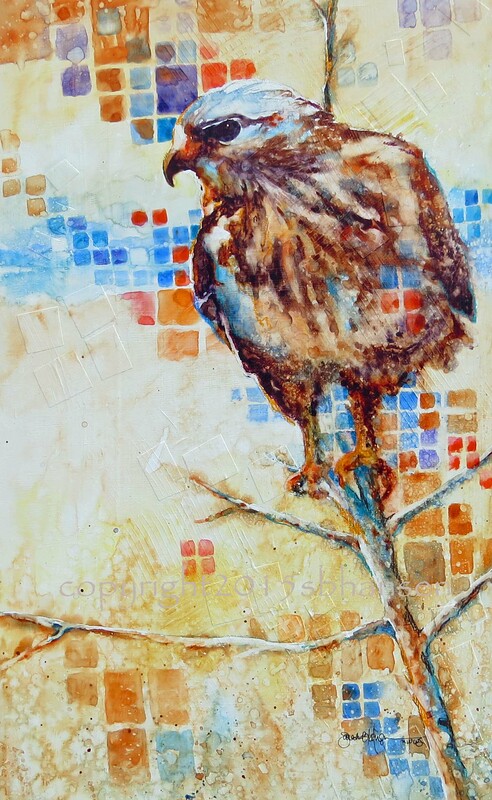 I splattered liquid mask and highlighted the sun-lit edge of the bird to keep it white. 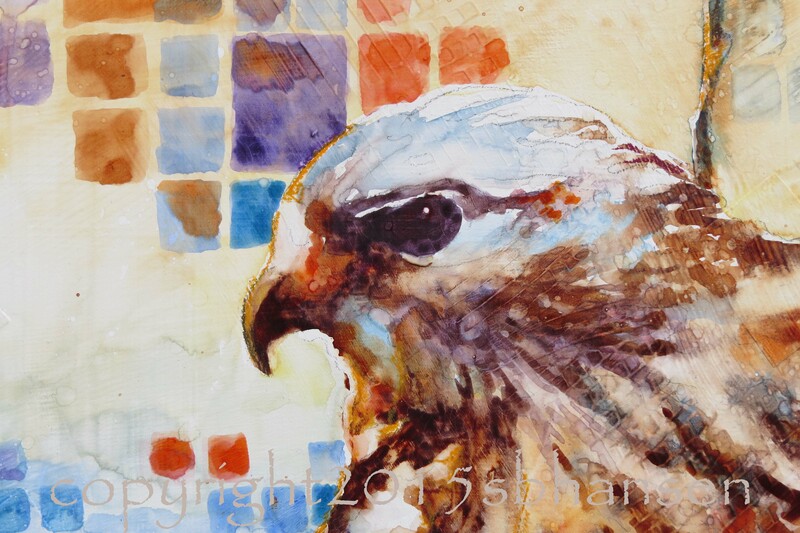 Above, you can see the detail of the falcon head, with its intense gaze peering off to the LH side. 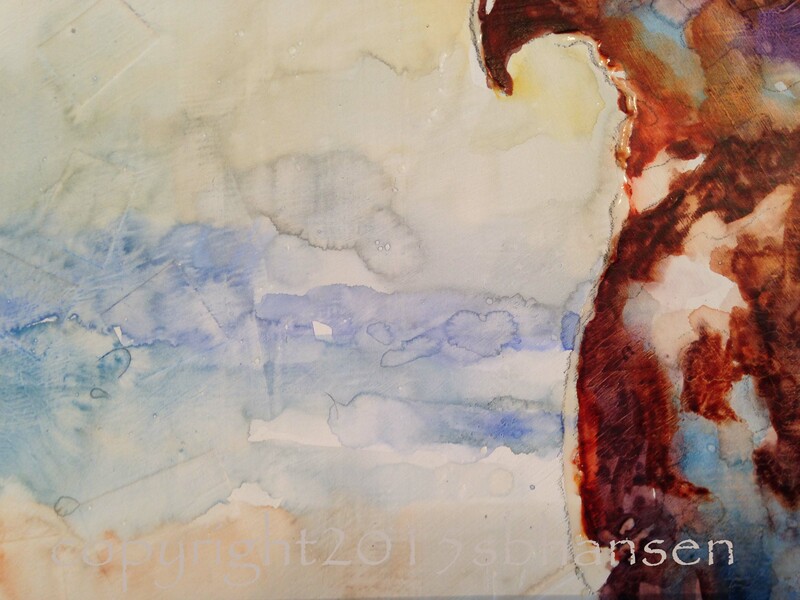 I chose to highlight its head with cobalt blue from the sky, knowing that I would likely be placing warm colors behind it, reminiscent of the Eastern High Desert of Oregon grasses and scrub brush. Above, I began to work on the body of the bird, laying in the patterns of the chest, throat, and wings. 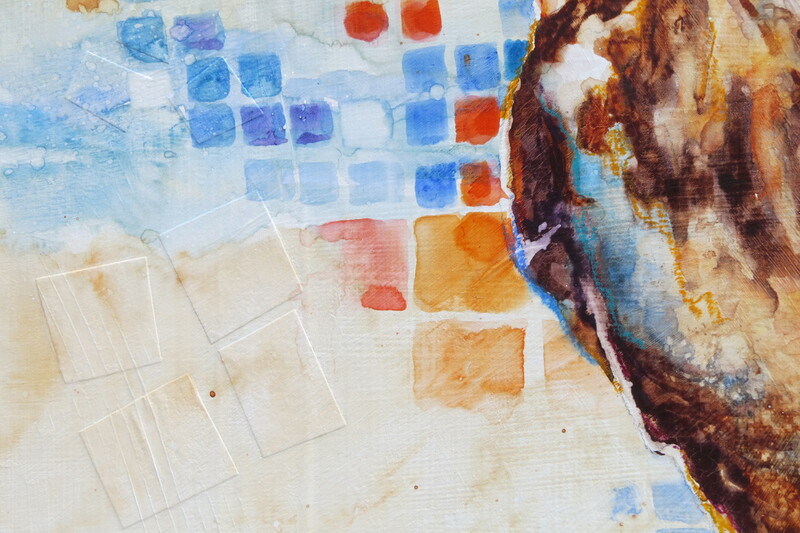 I used cerulean blue, quinocridone burnt orange, and gamboge yellow. 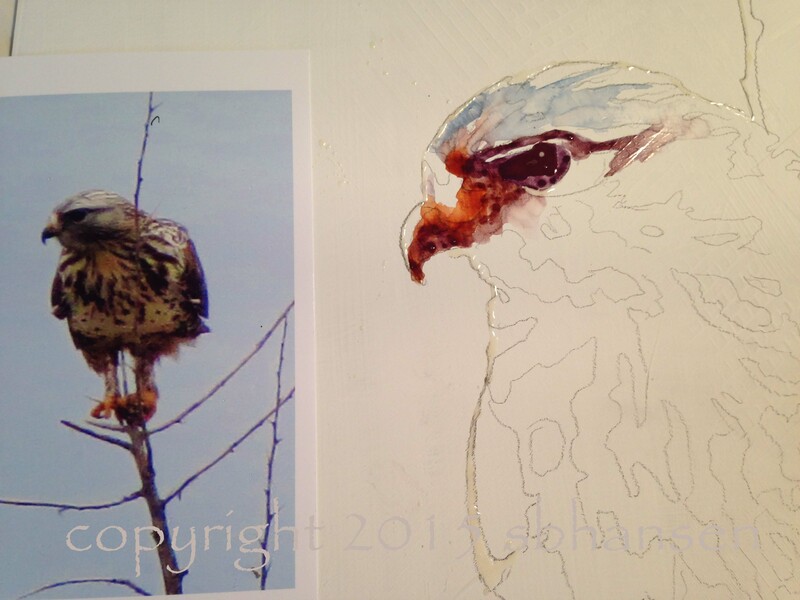 After I finished laying in the general colors of the falcon, I began applying the background. I wanted this painting to be different, striking in its values, composition, and unique properties. 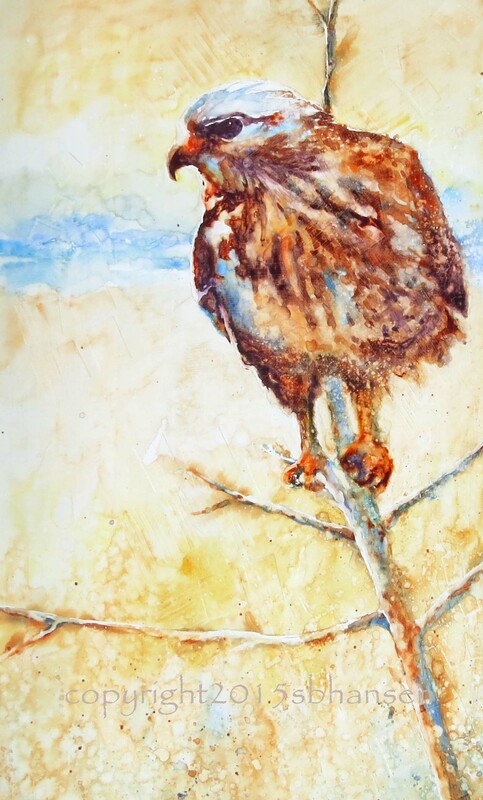 But I came up blank and decided to go with a calm background of distant hills and Malheur Lake to contrast with the hawk’s intensity and dark values near his head. I added texture to the foreground, by spattering water and paint. I decided to add squares to the background in a scattered diagonal line from the top LH corner of the painting to the lower RH corner. In the end, I didn’t ruin the painting at all! 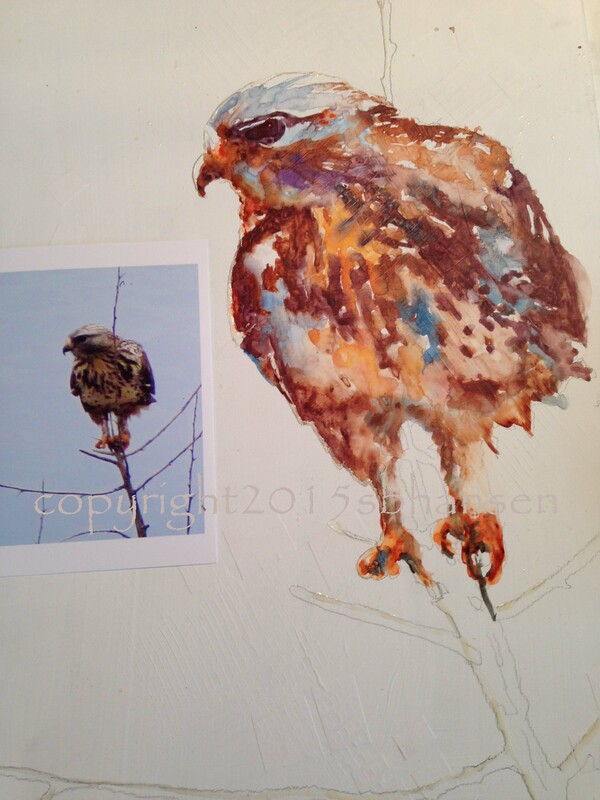 I ended up with a juicy, textural, and exciting painting of a small prairie falcon on the plains of Eastern Oregon. Much more exciting, right? I love the texture and diagonal movement of this painting, as well as the neutral browns of Eastern Oregon, popped with cobalt blue and purple. We all survived the bird trip, we do each year, but we come back a little crazier. My boys get pretty nutty after being pent up in the car for a whole day. We come home to piles of crumbled up cheese crackers, carrots, and sandwich parts crammed in between the seats and under piles of bird books, but happier.